Let’s start 2018 in a good mood with Lina Bou! Celebrating her “Good Food Good Mood Cookbook” release, we asked a few questions to our half Swedish half Spanish friend, nutritionist and blogger of My Taste of Health. You may have already tasted her healthy and happy cooking at Providence during one of her Sunday brunch… we will welcome again soon, promised! Where are you from, what’s your background (perso/pro)? My origin is half Swedish and half Spanish. I grew up in the countryside in Sweden. After school I traveled the world and when I came back to Sweden I moved to Stockholm to study Nutritional Therapy, Medicinal plants and also journalism. I have always been passionated about how the body works, especially how we influence it with what we eat, how we live (environment , emotions, mood + mind ) and physical activity. During and after studies I worked in different health companies in Stockholm, as a Nutritional Therapist and I also did some private cooking classes for a local quality food store. In 2012 I was craving new adventures so I quit my job and apartment in Stockholm, packed my bag and went to Paris. Why Paris? Because I had never been, I didn’t speak french, nor knew anyone in Paris and I thought it would be a really cool experience. Plus I wanted to spend more time writing and painting, and I thought Paris would be a good place to get inspired by. I was thinking that it would be a five week stay in Paris but I discovered the rest of France and here is where I ended up.. With a base in Paris but constantly on the road, more as a nomad than anything else, working all over France and also in other places in the world. A better adventure than I would ever imagine. How did got into a kitchen? I love to cook. For me cooking is my best art. It is funny, I never thought I would work in a kitchen, like, for ‘real’. I guess I didn’t like the idea of a sterile underground kitchen, with busy and stressed chefs running around. It doesn’t inspire me. I became very interested in natural foods quit young, living in the countryside far from cool food stores or cafés, I experimented a lot myself in the kitchen. I got inspired from online magazines and my travels, especially from NYC and Australia back in the days. I took very good care of myself and what I ate, lot’s of sport and good food made me happy and strong.. I learned a lot while experimenting on myself, and others.. When I worked as a Nutritional Therapist, I missed to use my hands and be creative. Food was a optimal combination for me, using my knowledge in plants and nutrition + my creativity. I started a food blog for fun many years ago, thanks to my friends that often asked for my recipes. It was more like a fun thing, but it became quit important. Those first weeks in Paris went by fast and I realized I needed a job because I wanted to stay longer.. I got a job at KB coffeeshop in Paris, and I was trained in coffee and it was also where I learned to speak french. 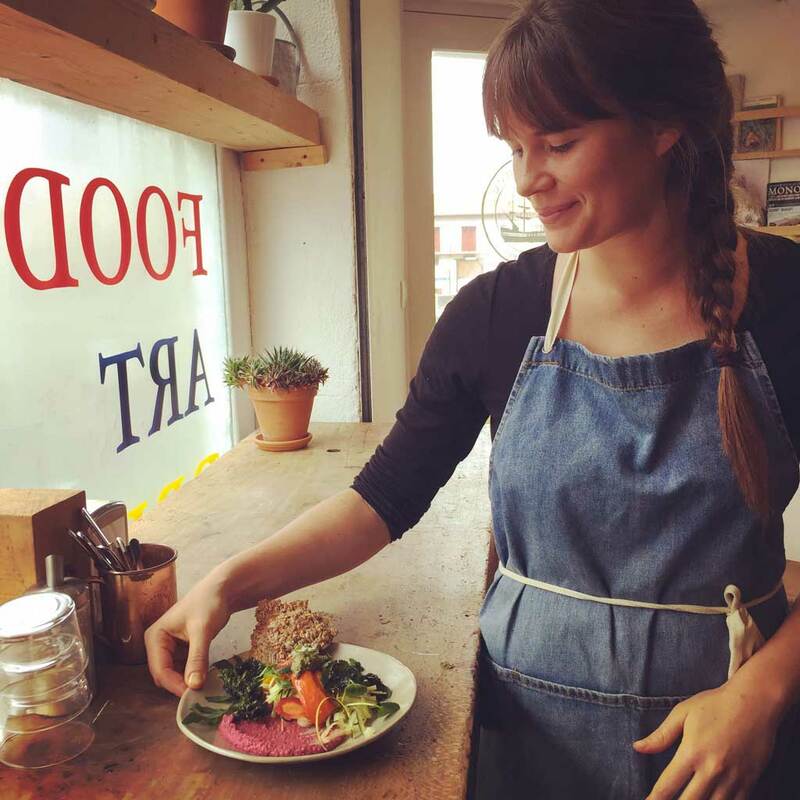 Short after I had my recipes on the menu like energy bars, granola and super juices plus one day a week I was doing the whole menu at the cafe including homemade bread, salads, soups etc. It was so much fun and inspiring. As things leads to other things, I did my first cooking assisting job for a Yoga retreat in Normandie with a fun group and great Ashtanga Yoga teacher Carolina Daza. Afterwards I got asked to cook for more retreats, with me as the chef. I went traveling to Italy, and then in different places in France… 2014 I got a position as a Manager and Chef at Cafe Smörgås. So I still had my daily work in Paris while fitting in traveling and different yoga retreats. The ‘side projects’ got too many and it was hard to keep up with all of it. So I decided to go freelance. And that’s about the story..
What’s your philosophy of life? of food? My philosophy of life, and food.. I think its to not make it too complicated. The more you complicate things, the less you have the time to enjoy it in the present moment. But the more we follow our intuition and natures rhythm the better.. With both life and foods. It is important to feel free and to enjoy life, whatever that is for you. Just be conscious and thankful to mother nature, it is really not cool to destroy more of this crazy beautiful world. Every individual have to take responsibility for their actions, in food and in life. All the choices we make will affect our personal little world and make a difference in the bigger one. Live your dream and spread good vibes. Book : out on January 9th right? how long and how hard was it to wright/make it? what was your motivation? Yes! It is out the 9th of January in UK and France and later this year in the states. It took me a long time to make this book, about five years since I first started. I wouldn’t say it was hard to do it, because from the beginning I started it as a fun side project on my own. The idea came from when I was working as a Nutritional Therapist, to gather all the questions that people asked me a lot and to give an inspiring cook book with recipes that was ‘digestible’ for everyone. I also wanted to pass the message that it is not only about what you eat that will make you feel a certain way… Our mind and environment has as much influence on how we feel and I think that to be “healthy” can have a very wrong and boring meaning sometimes. It was when I moved to Paris that I started the book, and I had a lot of fun. I met Sati, that became my very best friend in Paris and also the photographer of my book. We cooked and walked all over Paris streets and homes to find good light and spots to make the food photos, because we made everything with an analog camera. Three years ago I decided to finish the project and publish, magic happens and I found a great small publisher that was super open to all my ideas and visions about the book including my illustrations, collages and my own photos. My motivation; supporting and excited friends around me and the feeling of imagining my own book in my hands, I was very confident. What brought you to Providence? and what do you have in common? First time I came was with a friend from Cali , that also is expert in natural wine. We had super good natural wines and I fell in love in Guethary and in Providence. Common things: We love the ocean, good local foods and art. It is like many great stuff in one place. Fantastic. Such a great vibe. I feel a bit like the cafe myself, aha, I combine my hobbies in my profession and not only as a cook. Where are you now? what are you up to? what did you eat/drink for breakfast this morning? I am somewhere between Bordeaux and Biarritz on a train, finally getting back to Pays Basque after weeks of lots of travels.. I am organizing upcoming projects and travels and catching up on work after the holidays. For breakfast I had goat yoghurt with some buckwheat flakes, frozen wild blueberries, honey and many cups of green tea. If you had one of your classic recipe to share : which one would it be? can you share it with us? Gently melt the cacao butter in a water bath on low temperature (42°c for raw fooders and higher quality! ). In another bowl, add the cacao butter together with cacao powder, honey, salt, vanilla and spices and stir well until everything is mixed. Spread the almond pieces on a 15 x 10 cm glass tray and then top with the melted chocolate. Leave in the fridge until hard texture (4 hours), and then ready to serve! Thank you so much my dearest Lina! Follow her on instagram @linamytasteofhealth to get fresh news and recipes, and she will cook again back soon at Providence, for sure, stay tuned! “The Good Food Good Mood Cookbook” available here. This entry was posted in moments and tagged boy, brunch, cook, cookbook, food, good, guéthary, healthy, lina, mood, providence, release.